Mushroom Model Publications is based in the UK. All their books are printed in Sandomierz Poland by their associate Stratus Publications. The books are printed in both English and Polish. This book is in English. The book is soft-cover in MMP’s usual format for their books in 6 ½” x 9” page format. This book is 112 pages long. This new book is the 4th and last volume in a 4 volume series. Volume 1 was releseased in 2003 on fighters, Volume 2 was released the next year in 2004 on bombers, in 2007 volume 3 was released again on fighters. The copyright on this 4th volume is this year 2013. 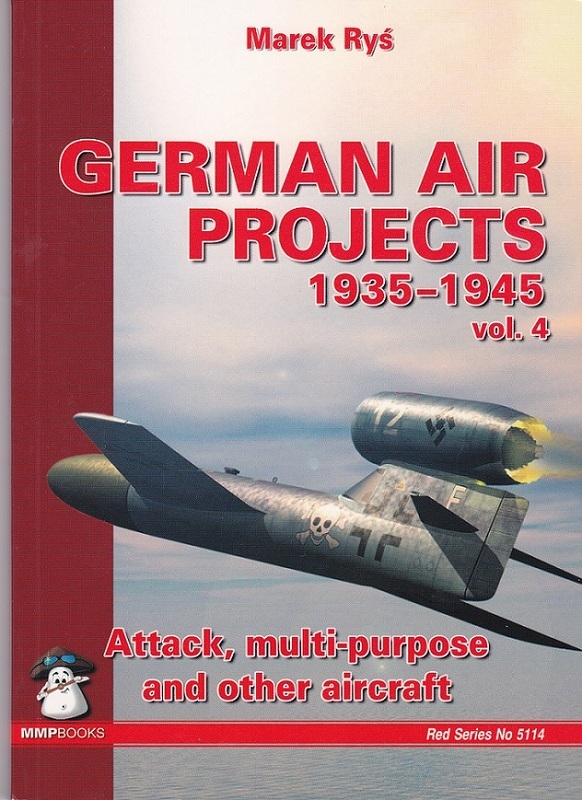 This is a volume of a complete history of might-have-been German Air Force aircraft projects from World War Two. The speculation about what the German Air Force (Luftwaffe) might have achieved if WWII had continued into 1946 and beyond is a fascinating and rapidly growing field of interest. This book continues some of this intriguing speculation with extensive believable illustrations of German bombers that were proposed, but which never flew, from the mid thirties until the end of the war. It looks at a rarely documented aspect of WWII aviation history. It also includes superb computer generated color artwork and black and white line drawing scale plans. There are eleven 3-view line drawings, 36 side profile line drawings, two 2-views and one 4-view. There are 48 computer generated color illustrations done by the author Marek Rys. The cover arts for volumes 1 and 3 in this series are shown on the back cover of this book. The cover art of this volume shows the Daimler Benz Project F flying bomb. 102 different project aircraft are described in the book. There are 6 specification lists added. These aircraft are either propeller, jet or rocket propelled. Some are un-manned bombs. One is a VTOL type aircraft that lifts off with a ducted fan and then was projected to use either 2 large or small jet engines for horizontal flight…neat! I recommend this book to all aircraft enthusiasts and the growing WHAT-IF (1946) group of modelers. I want to thank Dr. Roger M. Wallsgrove Editor-in-Chief of MMP and Casemate Publications for this review sample.